http://syncthing.net/ wrote: Syncthing replaces Dropbox and BitTorrent Sync with something open, trustworthy and decentralized. Your data is your data alone and you deserve to choose where it is stored, if it is shared with some third party and how it's transmitted over the Internet. Excellent. Very glad to see an open alternative. Will try to test out soon. Any sense of whether or not it does the delta copy thing? The site talks about incremental and versioning, but if you want just a plain sync, those things aren't needed. Someone brought up the topic of portability but it looks a little blurry at the moment. https://discourse.syncthing.net/t/204 wrote: Syncthing uses a single directory to store configuration, crypto keys and index caches. The location defaults to ~/.config/syncthing (Unixes), %AppData%/Syncthing (Windows) or ~/Library/Application Support/Syncthing (Mac) but is also settable at runtime using the -home flag. http://ind.ie/pulse/ wrote: Pulse (previously Syncthing) replaces proprietary sync and cloud services with something open, trustworthy and distributed. Your data is your data alone and you deserve to choose where it is stored, if it is shared with some third party, and how it's transmitted over the Internet. 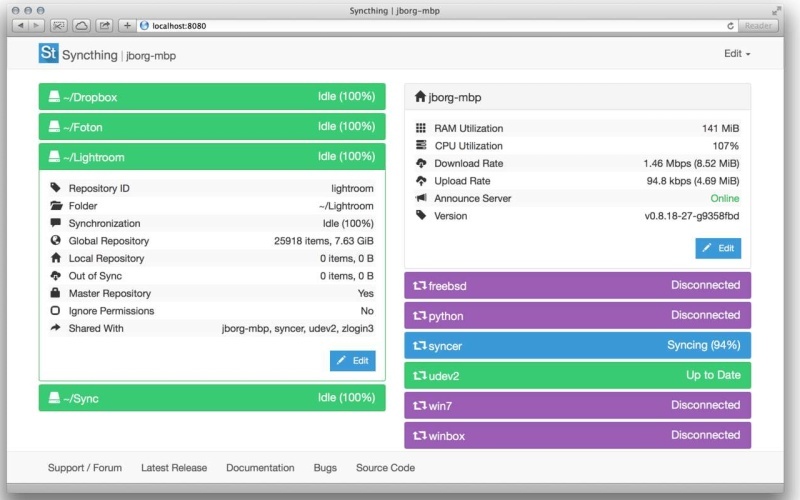 Syncthing is currently at v0.10.5 (changelog and download at github.com/syncthing/syncthing/releases/tag/v0.10.5). Also, a third-party Syncthing client for Android is available from f-droid.org/repository/browse/?fdid=com.nutomic.syncthingandroid. Upon launch, this will spawn both a command line window and a browser page, from where it can be administrated (click the little black cog wheel on the top right corner). I advise on choosing "Use HTTPS for GUI" and setting both a "GUI Authentication User" and a good enough "GUI Authentication Password" for starters. More info @ pulse-forum.ind.ie/c/documentation (and especially @ https://pulse-forum.ind.ie/t/getting-started/46). BTW, I managed to run Syncthing portably in Linux with the same trick mentioned above -- I would be very glad to read about other members experiences. thank you Midas for the wealth of information! we are heading to post-cloud now! i got a yapizied syncthing working, here is what i changed. Enternal wrote: The direction that Pulse and other things that they were going for was not something the original author of Syncthing think he/she can deal with. So they split off from Pulse and it's back to being just Syncthing. http://discourse.syncthing.net/t/syncthing-is-still-syncthing/1372 wrote: Syncthing is going to remain Syncthing. The reason for this is personal. [...] Ind.ie has taken on a fight against the currently ruling business and privacy models, and this is a fight I support. [...] But it's also a fight that I don't have the energy or will to be an active part of. [...] In the end it would mean either withdrawing myself from Syncthing or disassociating Syncthing from Ind.ie. I chose the latter. [...] I believe in correcting mistakes and moving on. Ind.ie is going to do their thing and may indeed maintain and release a fork of Syncthing under the name Pulse. They have my blessing to do so. Maybe tproli will add it to his collection of yaP examples. Sure! Thanks for the suggestion. I quickly wanted to address something I did some research on around the "Pulse" program connected to the "Stratosphere" project. I was a little bothered by everything I found about them. While I very much hope it succeeds (pro-privacy, anti-Google/Facebook), they have a big fundraiser happening on their site that I definitely wouldn't donate to. In addition to not being able to find much in the way of information, articles, press, or any clear efforts to explain what they're actually doing, the goals are extremely lofty (for starters a privacy-friendly, peer-to-peer cell phone). Meanwhile there are projects that are really working right now actively making cool stuff like Syncthing or any number of great, active projects. Yeah I can understand what you mean. There is barely any information on what they're trying to do, how are they going to do it, and their final goal or what would determine their successes is just baffling. Especially if you want people to donate, you need to have those things explained. It makes the whole thing looks like an idealist dream with no footing on the ground at what should be done to achieve it. Enternal wrote: It makes the whole thing looks like an idealist dream with no footing on the ground at what should be done to achieve it. Well said. Idealism is great and it powers some wonderful things but when it takes away from active projects that are actively dealing with the hard questions, that's bad. v0.10.18 of syncthing was just released.